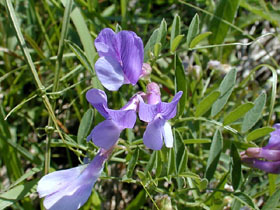 Vicia americana Muhl. ex Willd. var. minor Hook. Also Called: Narrow-leaved american vetch, stiff-leaf vetch. Stems: Reclining or climbing, smooth, often zigzag. Leaves: Alternate, even-pinnately compound, tipped with clinging tendrils; leaflets 4-14, stiff, narrowly linear to linear-oblong, to 1.25 inch long, less than 1/5 inch wide; margins usually entire; tips rounded, blunt, or abruptly pointed; stipules usually serrate. Flowers: Calyces slightly swollen on 1 side; corollas papilionaceous, 1/2 to 1 inch long, bluish purple; banner with notched tip; stamens 10, 9 united, 1 free. Fruits: Pods, smooth, around 1 inch long; seeds 8-14, round. Habitat: Dry prairies, lowlands, bluffs, and roadsides. Distribution: Throughout except southwest corner. Forage Value: American vetch is good forage that is readily grazed by livestock. It tends to disappear from pastured areas. Uses: Native Americans utilized many parts of this plant. The seeds were used as food; leaves were applied to spider bites; tea made from the entire plant was used as eyewash; and roots were kept in the pocket as a good luck charm when gambling. Birds also eat the seeds.